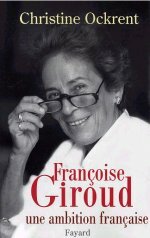 Following Francoise Giroud's death this year, Christine Ockrent published this biography on which they had worked together. Mme Giroud's life story is a page-turner and shows us the true "insider's" Paris. She was born France Gourdji, to an immigrant Sephardic Turkish family. Her birthright was a love of France and her intellectual ability. At the time of her death, aged 84, she counted among her many achievements the editorship of "L'Express", the management of ACF, a Nobel-winning charity and receiving the Legion d'Honneur. Her wish to exercise and retain power caused mixed feelings, all the moreso that she had a talent for the "mot juste". She was unkind to some in her portraits of modern "celebrities" and her remark on learning of Simone de Beauvoir's death was that she "dressed badly". As well as her pronounced work ethic, she had the ability to charm people, which led to speculation of an affair with Francois Mitterand. Not only did she achieve power in the world of journalism, but also in the world of politics, arguably with less success. Until her last days she wished to remain in touch with the world. She is remembered fondly by many and not fondly at all by some, but she is certainly remembered.